Short Info: Central Industrial Security Force has already released an official notification for CISF Recruitment 2018-19 of 447 vacancies. The great number of candidates has applied for the same. Those candidates who have applied want to know about their admit card and examination. There is the latest news for them. The authority has issued the CISF Admit Card 2018-19 for Constable Driver Examination. The CISF exam will be conducted on 17th February 2019. The applied candidates are able now to download their admit card. They can download it from the official website of CISF. Candidates can download via Date of Birth, Registration Number, Password and Captcha code. CISF Admit Card 2018 is a very important document for every applied candidate. Candidates should download it from the official website. Individual candidate, who is going to appear in the written examination, they have to carry the CISF Constable Driver Admit Card 2019 on the exam day. Because without the hall ticket, competitors will not be able to enter the exam hall. An admit card is a key to appear in the exam which available on the official website from 1st Feb 2019. The CISF examination will conduct on 17th February 2019. Applicants should download their admit card before the exam so that if there will any problem, they can consult with the Force. Applicants can download it from the official website. 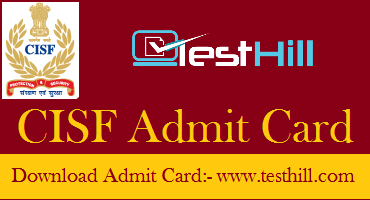 Admit card contains some important information regarding candidate and exam-like applicants name, competitors parents name, examination hall address, exam date and exam time etc.